The Khalil Mack saga wound its way to a close over a month ago, but fans quickly received a sequel. The Dallas Cowboys have reportedly sent a first-round pick in exchange for Oakland Raiders wide receiver Amari Cooper. After a drama-filled offseason, the Cowboys decided not to sign free agent wide receiver Dez Bryant and move forward with a receiving corps headlined by Michael Gallup and Cole Beasley. Through seven games, the Dallas passing game is led by Beasley with 33 receptions and 350 receiving yards (35th among wide receivers). Behind Beasley is star running back Ezekiel Elliott with 25 receptions and tight end Geoff Swaim with 19. Look down the list, and you don’t see another receiver until you reach Allen Hurns with 13 receptions. The Raiders sit at the bottom with a 1-5 record in an AFC West division that has competitors such as the one-loss Kansas City Chiefs and streaking Los Angeles Chargers. The Raiders’ poor record is due in large part to offensive idleness that worsened following the Marshawn Lynch injury. Cooper has been a major reason that the Oakland offense has produced at the level of which they have in previous seasons. Cooper entered the league and immediately made noise, posting two straight 1,000-yard seasons with 11 total touchdowns. In his third year, he only managed 680 receiving yards but preserved his ability to find the end zone with seven touchdowns. Complaints remain regarding Cooper and his ability to maintain consistent production, but there is a clear trend between his targets and level of productivity. Cooper has 19 games where he has 30 or fewer receiving yards, but he averaged 4.15 targets per game in the 19 poor performances as opposed to a 9.1 target average (more than double) in the other 32 games. Jon Gruden’s new offensive system in Oakland has not been kind to Coop, as the 24-year-old wideout has had just nine targets across four of the six games he’s played in. In the other two games, Cooper has totaled 244 yards and a touchdown from 21 targets (10.5 target average). 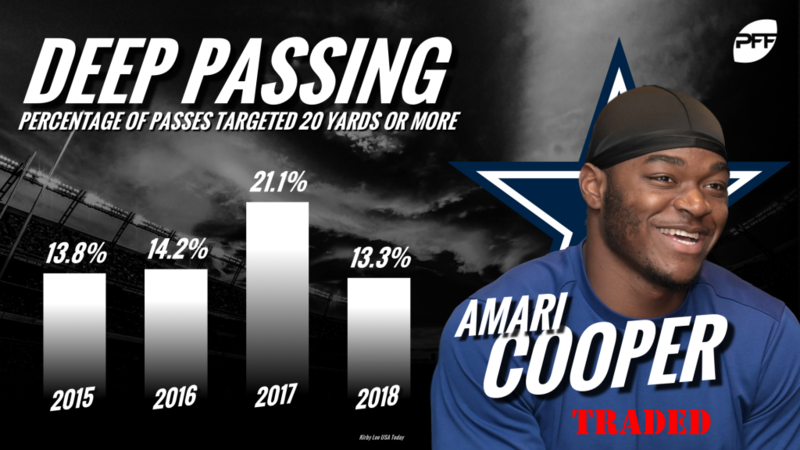 Although the Cowboys are a run-first team with Zeke at the helm, the targets will be there for Cooper in a Dallas offense that has been in limbo this season without a true number-one receiver. The 2015 first-round pick has a change of scenery and is expected to be the primary pass-catcher in Dallas moving forward. The Week 8 bye comes at the right time, as the Dak Prescott-to-Cooper connection will have two weeks to mesh before the Cowboys play the Tennessee Titans home in Week 9.